This spring, BoxOffice brings you a movie about a man fighting against all odds, a man determined to make a difference in the world. Global rugby icon, Joost van der Westhuizen shares his battle with a debilitating illness in Glory Game: The Joost van der Westhuizen Story available exclusively on BoxOffice from 7 – 21 September 2015. Known for years as the golden boy of South African rugby, the world reeled in shock in April 2011 when the news broke that Joost van der Westhuizen had been diagnosed with Motor Neuron Disease (MND). The disease attacks the central nervous system, causing progressive disability and there is no known cure. His game-changing prowess as a rugby player is now galvanised in a battle for survival and, more importantly, to make a difference to the lives of others with the disease. Despite specialist assurances that he’d be in a wheelchair in a year and not likely see his 42nd birthday, Joost not only celebrated in style, but took to the skies, travelling internationally with his J9 Foundation to meet the great minds who are working to find a cure. “In the beginning you go through all the emotions and you ask, Why me?’ It’s quite simple, Why not me?’ If I have to go through this to help future generations, why not me?” commented van der Westhuizen. Joost’s quest for a cure is relentless and his spirit has motivated those around him to champion the cause because in spite of the adversity he has faced, Joost remains a man to envy. For die-hard rugby fans, there are some fantastic prizes up for grabs including a limited-edition 20th Anniversary PS4 gaming console and a Rugby World Cup 2015 PS4 game. 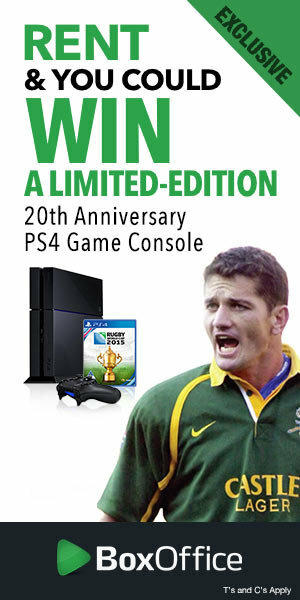 There is also an autographed rugby ball personally signed by Joost van der Westhuizen. BoxOffice is available to DStv Premium, Extra and Compact customers with a PVR decoder or an Explora. Renting a movie is R30 for 48 hours.